Add personal touches to transform your kids’ bedroom design and fill it with magic. They would be inspired to spend most of their waking hours in their room. You can create anything from stylish nurseries to teenage bedrooms. You can use your child’s individuality to personalize and decorate the room in various ways. Here are 12 cheerful and fun kids’ bedroom design ideas you would love to implement. Color the walls solid light grey while coloring the ceiling in striped yellow and light grey. From the ceiling, hang a shade of rows of pink and orange colored material providing the striped finish. Place a bunk bed with a wooden ladder and wooden railing in the upper bunk. Cover the beds with two identical bed-covers having broad stripes of green, pink, and red. Place a rug with stripes of all colors of the rainbow. Similar to the Solar System, the sun is stuck at the very center of the bedroom. From the center of the sun in the ceiling, there is lamp hanging. The decoration of the room shows all the planets are moving in their respective orbit around the sun. There are many stars and comets present in the sky too. The bed cover resembles the solar system where planets are moving in their orbits around the sun. Use light grey and light pink colors for decorating lofted girls’ bedroom. Color the ceiling light grey and hang a fairly large pink lamp shade. Color one of the walls in light pink. Place a white colored curved staircase having 4 curved steps connecting the two levels. On the top level, place a mattress covered in a printed-pink sheet. In the lower level, on the floor, place a grey colored mattress along with one light-pink and 2 light-grey colored cushions. Color the walls and ceiling dark grey or black color. Use vertical striped red, white, and black to cover the window and doors of the room. On one side of the wall, place a white colored bed with a cover made of black and white design. Place two matching cushions, one contrasting white colored and orange colored cushions. You can use a blue colored rug with circle and line designs in white. On this, you can place two huge cushions – one black and another red. Against these, you can place a striped (grey, green, white red, grey, blue and white) square cushion. Color the walls light grey and the ceiling light orange color to create the soft soothing lights. From the ceiling hang a globe shaped shade that provides light on the bed below. Cover the bed with soft light orange colored sheets and a cover of bright orange to break the monotony. Against the pillows covered in light orange, you can place a narrow black colored cushion and cylindrical embroidered cushion. You can use a printed shade for the window. Your child would love spending his time in the coastal style bedroom with nautical decor. You can place bunk beds with navy blue and white striped covers. Create cabinets for storage in the lower bed. You need to make protective white colored wooden railings for the upper bed. Use a steel staircase for reaching the wooden floor, the same level as the upper bed. Above the wooden floor, you should make a circular seat for your child. He would like sitting there to read under the light provided. From that floor, you can add another flight of 2-3 steps to reach the top of the nautical decor and ropes. Use a room with two broad windows looking out into the garden to create an alcove bedroom. On one side of the wall, you can have several shelves for storing. Also, under the bed and overhead, you can have several cabinets for storage. You can use grey colored sheets to cover the mattress and pillows. On the side, you can place a grey colored cushioned seat. Color the bedroom ceiling in grey and walls in green color. Draw a tree with flowers and fruits on the solid wall. Place a white and sea-green colored wooden table in front of it. On either side, place two single beds having metal frames. Cover these beds with identical covers and pillowcases with motives of trees. Place two sea-green colored chairs at the desk between three white colored wooden drawers. Against the wall, create two-door cabinets and several open space shelves for storage. Place a white sofa, wooden table with stools on a matching rug. The first step of the tree house is a cut from the log placed on the floor. 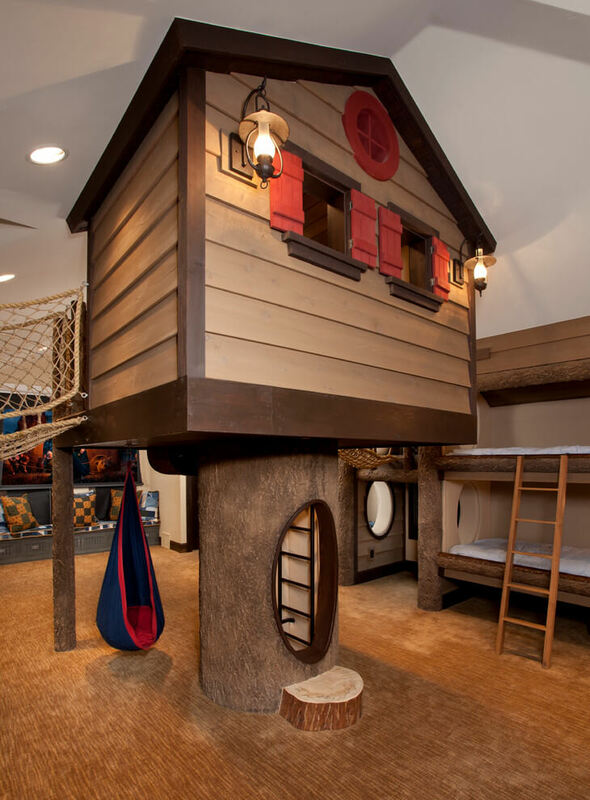 Your child will need to climb the ladder provided inside the vertical log to reach the inside of the tree house. The tree home is made of planks of horizontal wood. There are two windows besides there are two lighted lamps. On the outside, there is a bunk bed for two who can climb using the wooden ladder provided. The ceiling is colored blue and has a sketch of the battle airplane. There is another plane that has just landed drawn on the wall between the navy and white curtains. Also, cover the bed in various shades of blue. The cushions on the bed are light blue, dark navy blue and striped blue and white. A blue and white area rug defines the bed area. There is an unusual sitting arrangement made of white and red color. There is a robot in this room too. In the lower level, you can use the space for a playroom for the children. You can place a light blue rug to match the solid dark blue wall. Create rows of shelves divided into three compartments against the light blue wall. You can use these spaces for storing children’s books, toys, and games. Also, you can leave two (red and orange) colored bean bags for sitting. You can place a red colored box for your children to sit on. Also, you can hang a colorful hammock for your children to sit and enjoy. In one corner, you can add a wooden staircase with steel railings. Climbing this leads to the bedroom above.